Most of you know another health insurer has been hacked. Washington State's Premera Blue Cross said the personal information of 11 million of its customers has been compromised. That breach was discovered on Jan. 29 and is just now coming to light. Premera is offering two-years of free credit monitoring and ID theft protection services to its victims. Premera Blue Cross is the latest large insurance firm to be hacked and lose personal data. The company had 11 million of its insureds compromised and — like Anthem who was hit to the tune of 80-some million — the information taken was names, dates of birth, email addresses, home addresses, phone numbers, Social Security numbers, member identification numbers, bank account information and claims information, including clinical information. In the Oregon Senate insurance bills — one on bad faith lawsuits (SB 313), and one putting insurance under the Unlawful Trade Practices Act (UTPA) (SB 314) — were heard on March 16 in the Senate Judiciary Committee. 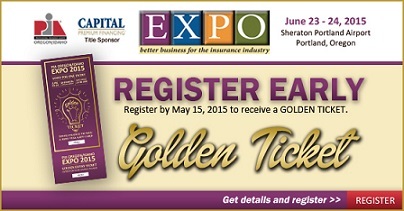 EXPO is all about business to business and quality education for all agents, agency and company personnel. Last year's EXPO was a huge success. More than 200 independent insurance agents registered. The PIA Oregon/Idaho trade show floor is almost full. If your company doesn't have its booth set up yet, you need to move fast the few remaining booths will not last long. Click this link to get started. Recently, MSN Money posted three very interesting stories on business trends. It looked at the eight most troubled industries in the U.S. and those likely to cease to exist soon. A second story profiled notable chains that are closing stores at an alarming rate and the third shows chains whose business is booming. Here, we look at the industries we're likely to see disappear in the near future. E&O: How do you handle rejections? Every day, agencies provide prospects and customers with proposals on coverages addressing a multitude of exposures. Some proposals are provided at the anniversary of the customer's insurance program, while others occur during the policy year, more of a midterm situation. While it would be nice if the customer bought coverages that were proposed, unfortunately, that is not the norm. In California, water rationing is in effect. The state has been bone dry for four years. And it's likely to grow worse and not better the rest of this year. Around the nation's Western states things aren't much better. The consulting firm Vantage Hill Partners recently did an interesting study of CEOs. The title What CEOs are Afraid Of says it all. And the number one fear of the 116 surveyed is being found incompetent. Deloitte said the average merger or acquisition deal value rose 60 percent between 2013 and 2014. The rise is mostly in reinsurance deals but Deloitte thinks this is going to expand into primary insurers as we move farther into 2015. Budgets submitted in the Senate and the House are calling for the repeal of the Affordable Care Act. The House has — by itself — repealed Obamacare more than 40 times since Republicans gained control of the House in the third year of the Obama presidency. Q&A Research does full-service, qualitative and quantitative research for this company or that. Recently, it took a look at insurance company mascots and judged them for effectiveness. The 2015 Insurance Spokesperson/Mascot Survey looked at current and retired mascots.